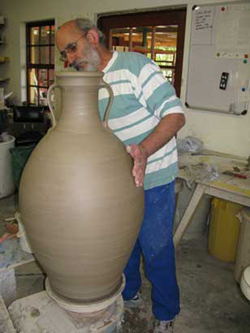 David Schlapoberky throwing. Small oil fired kiln packed & ready for firing. Felicity at work. 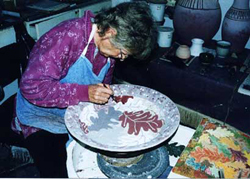 Felicity Potter applying oakleaf decoration to a large stoneware platter Raku firingl. 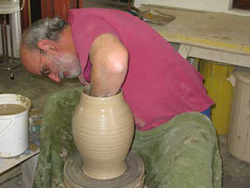 David Schlapobersky throwing a stoneware jar. 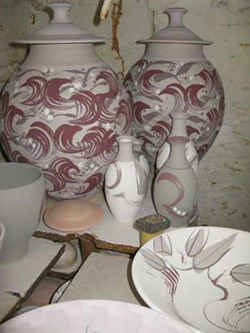 Glazed & decorated pots ready for glaze firing. 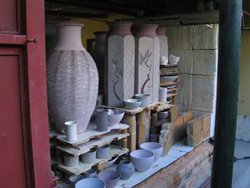 Big oil kiln packed for glaze firing. 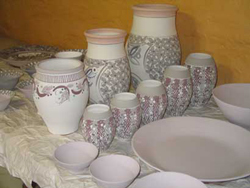 Glazed & decorated pots ready for glaze firing. 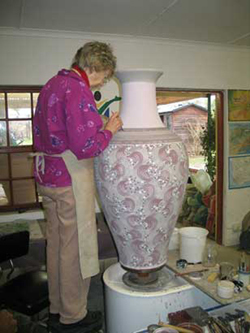 Felicity Potter decorating a large urn. 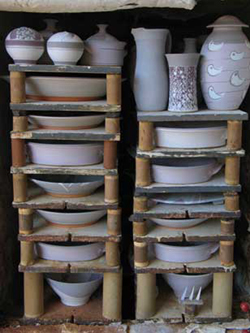 Packing small oil kiln for glaze firing. David-throwing. 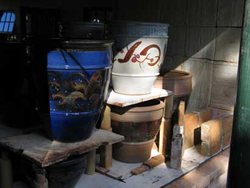 Bisque stoneware pots at the big oil fired kiln. Small oil kiln packed & ready for glaze firing. 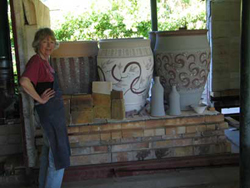 Felicity Potter decorating tiles. 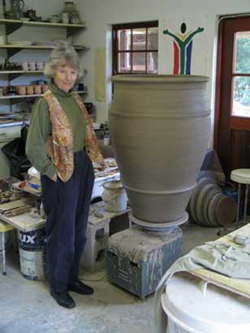 Felicity Potter with a large thrown floor jar. Felicity potter at the packed big kiln. 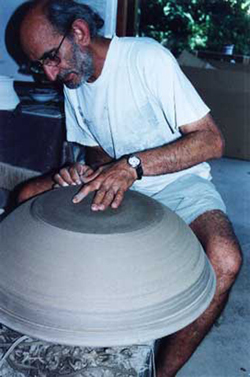 David Schlapobersy trimming a large platter. Big kiln packed for a bisque firing. 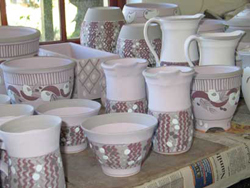 Completed glaze firing in big kiln. Big kiln packed for glaze firing. 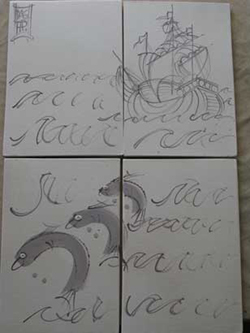 Tile panel with caravelle & dolphins before glaze firing. 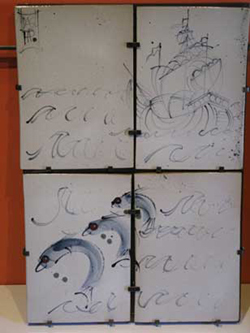 Oil burner in operation Tile panel with caravelle & dolphins after firing. 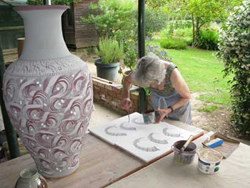 Felicity Potter decorating a stoneware vase Chimney pots. 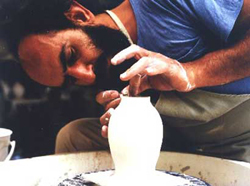 David Schlapobersky throwing a porcelain vase. 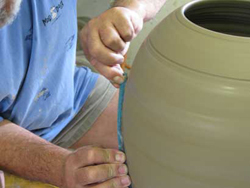 Attaching handles to a large pot. Felicity through the pots. 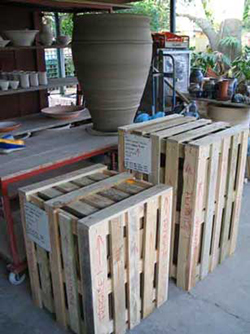 Crates packed & ready for shipping overseas. 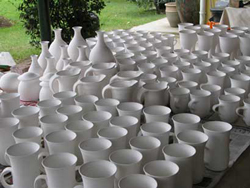 Porcelain mugs, jugs goblets etc drying. 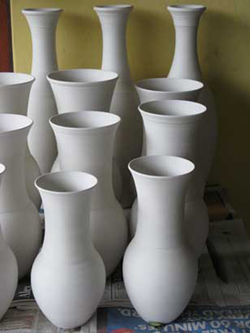 Porcelain vases drying. 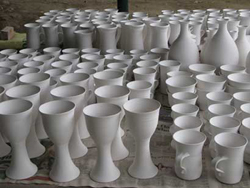 Porcelain mugs, jugs goblets etc drying. 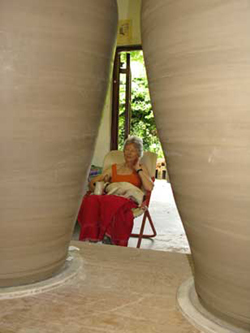 Garden lantern, japanese type, 1200mm tall drying before firing. 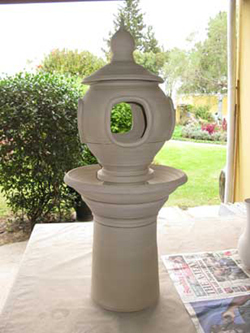 Stoneware bird feeder 600mm tall drying before firing. 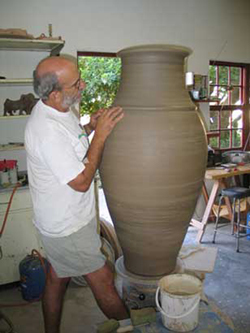 David schlapobersky throwing a very large stoneware floor jar. The larger pieces, up to 90kg in weight require a very long drying out period and shelving, table space and trolleys are all necessary, particularly during winter. 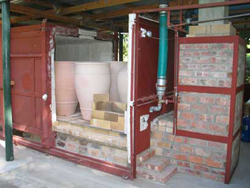 A 40 cu ft oil-fired (paraffin/kerosene) kiln, lined with “Ceramic Fibre”, used in the production of tableware, stoneware and porcelain as well as medium to large sized stoneware. 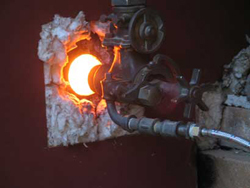 A 100 cu ft rolling hood oil-fired (paraffin/kerosene) kiln, lined with “Ceramic Fibre”, used mainly for our very big work. 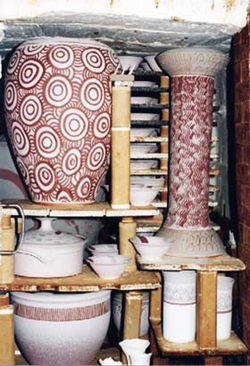 In addition, there is a medium-sized electric kiln used for bisque and lustre firing, and a small gas-fired ‘test kiln’. The five potter’s wheels in the studio are all electrically driven and David’s preferred wheel at present is an old Shimpo made in 1982. 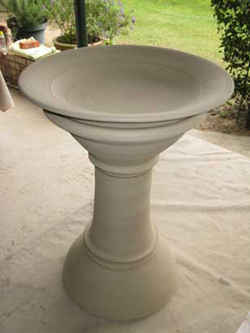 It is on this little wheel that the biggest of our pots are thrown. 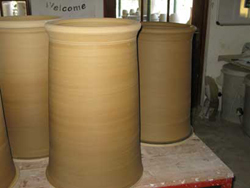 We work jointly on the same pieces, and the working area is common. 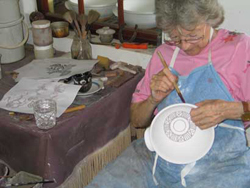 Felicity using a potters wheel with a banding wheel placed on top of it as her work surface. 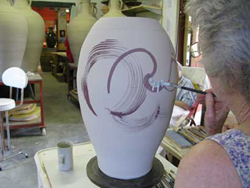 All glazes, decorating slips, oxides and pigments are blended and mixed in the studio. 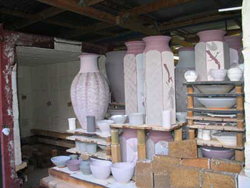 Both our stoneware and porcelain clay is prepared at the studio. 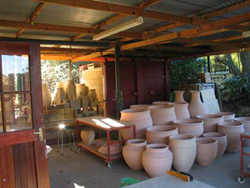 Raw materials are delivered in large quantities and stored at the back of the workshop. 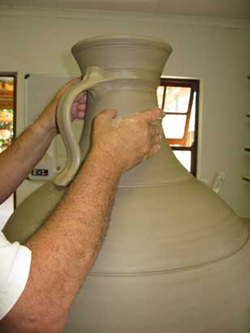 The clay is mixed by hand and then dried out in large canvas-lined brick drying trays prior to pugging and storage. 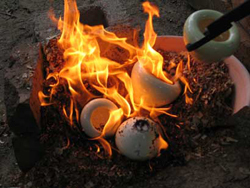 Bisque firing is at 1 000°C, and glaze firing in a reduction atmosphere to 1 320°C, Orton cone 12. Thank you for spending time on our Our Process pages.